In what could become the largest-ever employer-related settlement claim, a Federal Court judge ruled that school bus contractor, First Student, is part of a proposed $5.9 million settlement fixed to criminal background checks that were conducted without written permission. Perhaps we shouldn’t be shocked to hear that anyone might be doing employment screening without consent from the applicant, but indeed we are. Shocked. The Fair Credit Reporting Act (FCRA) requires employers to obtain an applicant’s written consent before conducting an employment background check. Plus, if an employer wants to take action in whole or in part on the results of a criminal check (or any consumer report for that matter) the employer must meet certain criteria. 2. The employer must supply pre-adverse action notification to the applicant if the information found in a report may – in whole or in part – result in a no-hire decision. 3. The employer must provide adverse action notification to the applicant if the information found in a report does result in a no-hire decision. Have questions about your background screening rights and responsibilities? Ask one of our background screening experts or drop a comment here and we’ll be happy to chat. 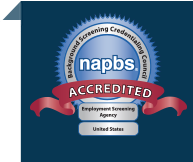 Looking for more information about background screening? Download our free background screening guide. As always, please note that the information contained within this blog is for informational purposes only and must not be construed as legal advice. Contact a qualified employment attorney if you have legal questions.